I've finished the two experiments I described in the last post: (1) a time course to find out how long it takes for induction of sxy by IPTG to give production of beta-galactosidase by the ppdA::lacZ gene fusion, and (2) a 'dose-response curve' to see how much IPTG is needed to induce the fusion. And I'm posting the resulting graphs, along with a sketch of the E. coli cells I'm using for this experiment. The sketch shows that the cells contain two plasmids. The one on the left is pASKAsxy; it carries the E. coli sxy gene (red) under the control of the Plac promoter (blue arrow). 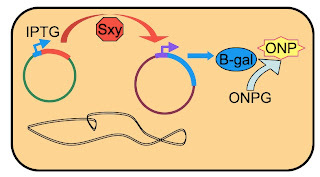 This promoter is normally OFF in these cells so the sxy gene is not expressed, but the promoter can be activated by adding a lactose-analog called IPTG. The plasmid on the right carries the lacZ gene, which codes for the enzyme beta-galactosidase. Here the lacZ gene has been placed under the control of the ppdA gene's promoter, so when ppdA would be expressed, the cells make beta-galactosidase. Beta-galactosidase normally digests lactose, but I can easily detect it because it also digests another lactose analog called ONPG, producing a bright yellow chemical (ONP). Here's the time course. I set up three cultures. One got no IPTG, one got the standard amount of IPTG (1.0 mM) and one got tenfold less (0.1 mM). 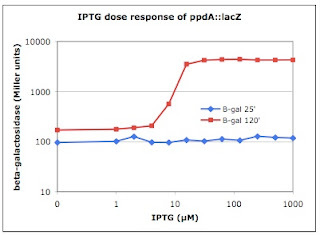 It's easy to see that tenfold less IPTG gave just as strong a response as the standard amount, that neither dose produced a significant increase in beta-gal until at least 40 minutes had elapsed, and that there was a bit more beta-gal at 90 minutes than at 120 minutes. So I have the most basic information I need. When I go on to test induction of the ppdA promoter by treating cells in ways that I think might induce expression of the normal chromosomal sxy gene, I now know that I should allow at least an hour to see the effect of my treatment. There are no error bars because I only tested each combination of dose and time once. I'll need to repeat the experiment with more replicates to get publishable results. I'll probably also want to use more time points in the interval between 40 minutes and 90 minutes, and to try a denser culture as well as the quite dilute one I used this time. It is worth repeating this experiment and getting some more details, because I find this long delay quite surprising. One control I didn't do is to examine IPTG induction of the normal lac operon (the lac promoter driving expression of the lacZ, lacY and lacA genes), but this is a very standard experiment done in most introductory biochemistry lab courses, and as I recall the ONPG starts to accumulate within a few minutes. A Google search just turned up a paper about mutations that affect transcription, which used IPTG induction of lacZ as an assay; their control showed that beta-gal began to accumulate after 2.3 minutes. 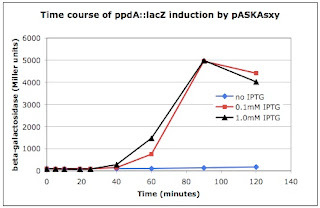 If we assume that induction of the pASKAsxy promoter by IPTG starts producing Sxy by 2.3 minutes, why does it take so long for Sxy to induce the ppdA promoter and cause beta-gal to start accumulating? Is the sxy mRNA translated very inefficiently, so accumulation of enough Sxy protein takes a long time? Is the ppdA promoter activated only once a lot of Sxy has accumulated? The results may have implications for competence induction in H. influenzae too. We've found that cells need about 45 minutes to become competent, but I have been assuming (perhaps wrongly) that this time is mainly needed for assembly of the uptake machinery. We have some fusions of lacZ to H. influenzae competence gene promoters; I (or someone) should test the kinetics of induction of these. Here are the results from the dose-response analysis. In this graph the X-axis is IPTG concentration, not time (and note the log scale on both axes). 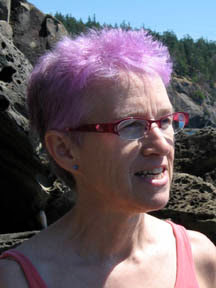 IPTG was added at time 0. We see that any IPTG concentration above 10 micromolar gives full induction (about 40-fold) after 120 minutes, and that even the highest concentration doesn't give any induction at 25 minutes. This may not be very useful information; because I don't have an easy to measure Sxy production directly, it may just tell me about the sensitivity of the lac repressor to IPTG. So what next? I'm going to grow the cells containing the ppdA::lacZ plasmid (no pASKAsxy) and try the same changes to culture conditions I previously tried with the ppdD::lacZ fusion (which I now know couldn't have worked because it isn't inducible by Sxy). 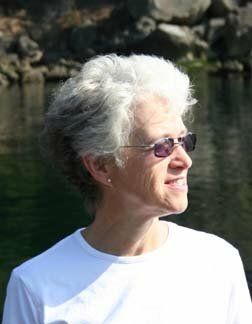 I am confused--why do you keep saying in your posts that ppdA::lacZ is NOT induced by Sxy? It seems as though your recent experiments suggest otherwise. What am I missing? I have a question, why is the graph of the rate of beta-galactosidase over time non-linear?